Parts of the federal government are shut down. But needless to say, the weather has continued. There's a bit of extra snow on the ground here in Washington. Rain is sweeping through the West. And emergency workers in many places need information from the government to respond. NPR's Rebecca Hersher reports the weather does not care that the government is shut down. 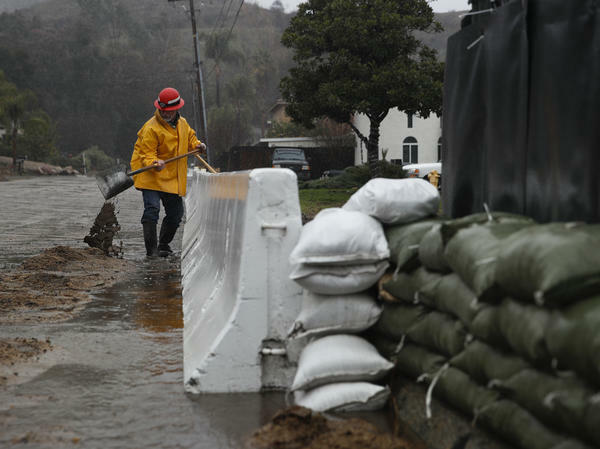 REBECCA HERSHER, BYLINE: On Wednesday, Christopher Berry was at his office in Santa Cruz, Calif., worrying about the rain. CHRISOPHER BERRY: We have a storm event predicted to start, literally, in a matter of hours here, where we're going to get six plus inches of rain. HERSHER: Berry is the watershed manager for Santa Cruz. And when it rains a lot, one of his jobs is to figure out whether the river that flows through the city will flood. To do that, he relies on stream gauges that tell him how much water is flowing down the river. BERRY: We use stream-gauging data on a moment-by-moment basis. HERSHER: The most important gauges for Santa Cruz are managed by the U.S. Geological Survey. But the USGS is shut down, which means the gauges aren't being calibrated. Berry can't trust that gauge measurements are accurate. BERRY: So we know that we could have better data if the USGS staff were out in the field. HERSHER: Which is why Barry was worried on Wednesday - he was trying to help the city plan for a rainstorm. But he couldn't trust the information he was getting, which is frustrating and scary. Across the country, the National Weather Service is fielding phone calls from nervous local officials like Berry. Unlike the USGS, the National Weather Service is still open during the shutdown to make sure we all - regular citizens, emergency managers, airline pilots - have accurate weather forecasts. RAY MARTIN: Yeah, we are always here 24/7, 365. HERSHER: Ray Martin is the lead forecaster in the Sterling, Va., office. He's also the office's union steward. And he says his workdays are pretty normal with one exception. MARTIN: I can't tell you how many times in the office I've heard the comment, you know, just going to work again like usual but not getting paid, you know (laughter). HERSHER: Working for the weather service often requires working for many hours or days on end. Ray worked 13 days straight around Christmas without pay. And storms like the back-to-back snowstorms that have hit the Midwest and East Coast only add to the workload. The phones ring off the hooks during bad weather. Alicia Miller is a hydrologist and union steward in the Pittsburgh office. ALICIA MILLER: I do have two children. And it's very hard to explain to a daycare that I'm working and they have to watch my children, but I'm not going to be able to pay them. HERSHER: For now, Miller has been cutting back on other expenses so she can afford to pay. How much longer can you go on? MILLER: Not - realistically, not much longer. A month more would be very painful for me. HERSHER: And the longer the shutdown goes on, the greater the risk for people like Chris Berry back in Santa Cruz, who are operating without important federal data. I called him back the morning after the rainstorm. BERRY: I would say we basically got lucky. HERSHER: The river didn't flood this time. But if there's another rainstorm before the government reopens, he says, the risk of unexpected flooding will be even higher. Rebecca Hersher, NPR News. Transcript provided by NPR, Copyright NPR.